FARNBOROUGH, England. 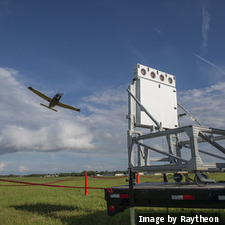 Engineers in the Intelligence, Information, and Services business unit at Raytheon demostrated its Low-Power Radar's ability to provide precision approach guidance to landing aircraft from 15 nautical miles. U.S. Navy, Army, and Air Force officials in Brockville, Florida were present during the demo late June. LPR is a small, one-meter square Active Electronically Scanned Array (AESA) multi-mission x-band radar ideal for precision approach landings, aviation surveillance, precision weather observations, and small drone detection and tracking. "This radar is like a Swiss Army Knife; it has broad applications across a lot of missions," says Matt Gilligan, vice president of Raytheon's Navigation, Weather and Services mission area. "Its extended range expands options for managing multiple fast aircraft on approach." LPR's origin as a weather radar gives it an advanced dual-polarization capability that allows it to discern between heavy rain, hail, snow, and sleet. 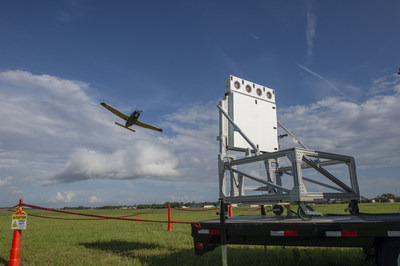 It can also detect non-meteorological echoes from ground clutter, birds, and tornado debris. It does this by transmitting and receiving both horizontal and vertical polarizations, unlike most radars that only transmit and receive radio waves with a single polarization.